Lulu & Luca was set up by fashion and textile designer Leanne Lucas. She studied Fashion Design at Northumbria University before working as a designer in the fashion industry and setting up her own screen-printed textile business. Her beautifully bold prints are inspired by a love of mid-century textiles, geometric patterns and botanical forms. 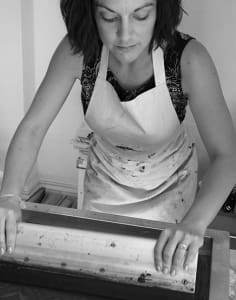 She has recently introduced screen-printing workshops which are held at the print studio which she shares with fellow artists, designers and makers. These workshops are a way of sharing her knowledge and expertise in textiles and print design and to help you bring your creative ideas to life.